People understand that our governments are opaque and corrupt. When talking about their pessimism about politics, they say “well, the government is bought by Big Money”—and that’s true. But FPTP is extremely vulnerable to corruption, and that corruption, along with the fact that most of our votes don’t count under FPTP, both generate enormous political apathy and disengagement. But how exactly does First Past the Post facilitate corruption? It’s down to a simple structural fact: under FPTP, hardly any votes matter. 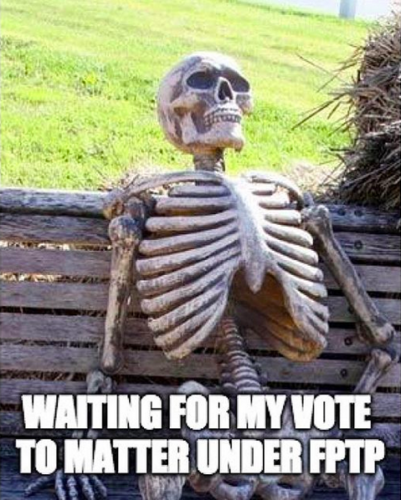 The only votes that matter for the 2 main parties (which forever remain the two main parties under FPTP, because the strategic voting that FPTP encourages inevitably gives power to the 2 main parties) are the 2% of voters at their mutual boundary. They don’t need to expand their bases through great policy—they only have to be marginally better than the other party they’re vying with in the opinion of that very specific 2%. So both parties narrowcast all their efforts and messaging at that tiny minority of swing voters and swing ridings. None of the rest of us matter at all. 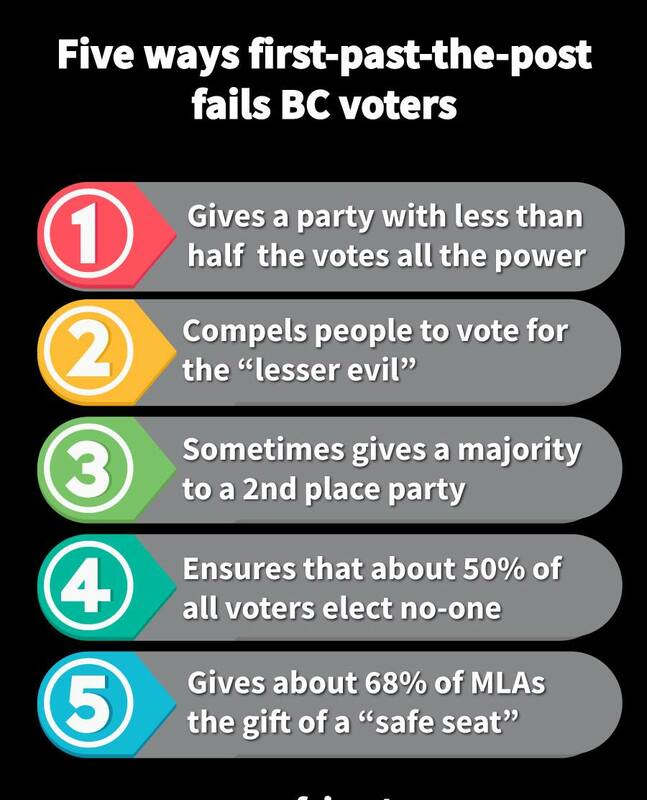 Most of our ridings are “safe,” and our ideas and preferences are thus irrelevant. Our votes simply don’t count, so our priorities don’t make it through the Legislature door. It’s as if the many things that vast swaths of BCers care about simply don’t exist. This is why our politics seem so disconnected from anything actually happening on the ground. Far too much of our political dysfunction comes down to First Past the Post. FPTP was never designed for a multi-party environment like ours. It’s irreparably broken. Proportional representation, on the other hand, brings more stability, new ideas and oxygen into government. 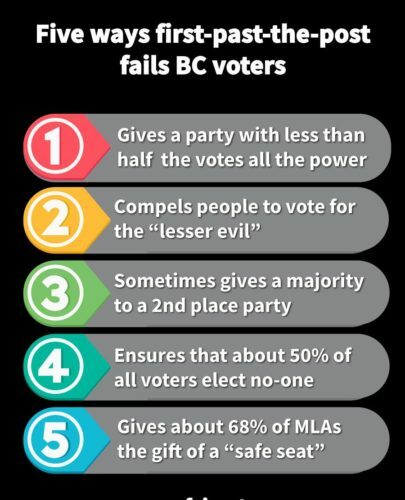 The fractious yelling is lessened, parties are forced to work together cordially, and the ideas of BCers all across the province are better represented. Contrary to the fearmongering of the No side, PR is the far more stable, far less extreme, and far more hopeful system. The vast majority of the countries in the list of the world’s top performing economies use Pro Rep. They also tend to have better social development. There are many more arguments that can be made in favour of Pro Rep, but I have decided to stick to my major beef with FPTP here. 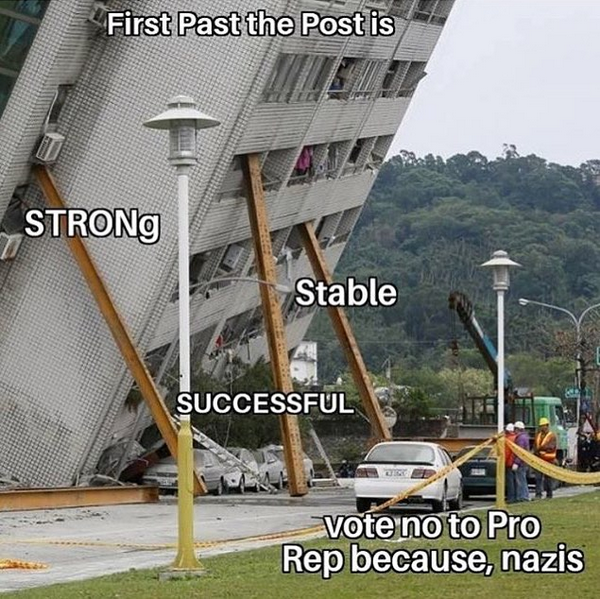 No matter which of the three types of Pro Rep we might end up with, they will all be infinitely better than First Past the Post. Find many informative articles on Pro Rep in the articles below. We have only 2 weeks left to win this referendum. This race is going to be extremely tight, so every single vote counts. Please help us defeat the broken system that’s standing in the way of a healthier future. Vote Yes to Pro Rep, and urge everyone around you to do the same. Thank you, thank you, thank you. 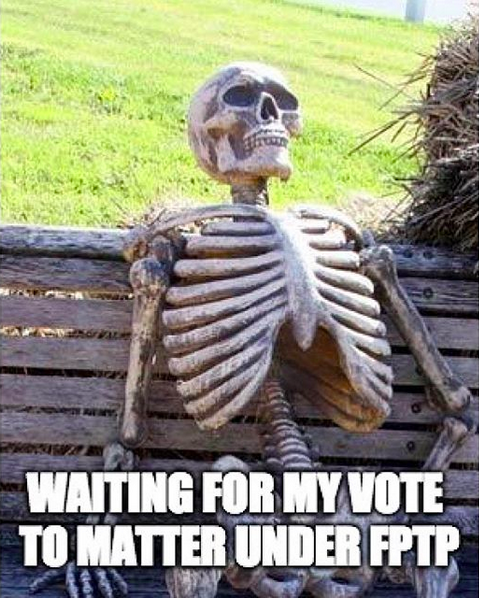 Oh, I forgot: how did I vote? For question 1, I voted Yes to PR. For question 2, I ranked the 3 choices in this order: Rural-Urban Proportional (a form of STV); then Mixed Member Proportional, then Dual Member Proportional, in that order. But you don’t have to answer question 2 if you don’t want to—if you leave it blank, it doesn’t spoil your ballot. I recommend answering it though. 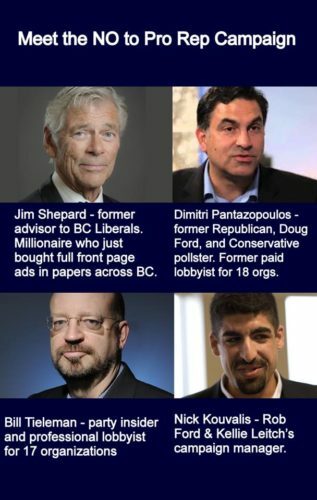 Oh and we’ve had Pro Rep in B.C. before: it’s the system WAC Bennett was elected under in BC years ago! Last but not least: Justin Trudeau betrayed us on electoral reform federally. So why is this page still up on the federal government website? This entry was posted on Monday, November 12th, 2018 at 2:19 pm	and is filed under British Columbia, politics, urban planning, Vancouver. You can follow any responses to this entry through the RSS 2.0 feed. You can leave a response, or trackback from your own site.